This year’s midterm election has been compared to a number of others. But few political observers have brought up the election of 1962, whose outcome should serve as a cautionary tale as the 2010 campaign winds down. That election nearly a half century ago was redefined in its closing weeks by one of the greatest and most dangerous international crises in American history. At issue, the introduction of Soviet missiles into Cuba capable of launching a nuclear attack on the American mainland. That, in turn, could have produced a full-scale nuclear war between the United States and the Soviet Union. The crisis itself covered much of the latter half of October 1962 and froze the midterm campaign in its tracks as the world’s two superpowers stood eyeball to eyeball. It was the ultimate test of strength and judgment for the young president, John F. Kennedy. And he passed it. The Soviets backed down. The president’s popularity soared. And his Democratic colleagues in Congress, many of whom were bracing for significant midterm election losses, saw their numbers stay virtually unchanged on Election Day. The Democrats lost only four seats in the House, while gaining a handful of seats in the Senate – a far cry from the heavy losses that the president’s party has usually sustained in midterm elections. The outcome of the Cuban missile crisis and the election that followed increased Kennedy’s stature on both the national and international stage. It also served as an important lesson for generations to come. Namely, that an election is not over until the voting takes place. Cuba had actually been on the political radar screen throughout the 1962 campaign. Just 90 miles off the southern coast of Florida, it had a newly minted Communist government headed by its revolutionary leader, Fidel Castro. By the early fall, Cuba had already become a flash point in East-West relations. The Soviets had begun sending technicians and weaponry to Cuba for what they claimed was the island’s defense against a possible U.S. attempt to topple the Castro regime. But the situation did not reach crisis proportions until mid-October, when U.S. reconnaissance found evidence of sites being rapidly constructed in Cuba where Soviet missiles could be launched to strike the American mainland. Within hours of receiving notice of this new Soviet threat, Kennedy convened the first of many top secret meetings of a group that became known as “ExComm.” The group, which was to monitor the crisis and recommend an appropriate response, ranged upward in size to about 20 members. Members included President Kennedy and Vice President Lyndon Johnson, military and national security experts, foreign policy hands, a White House adviser or two, and a few Cabinet members, among them the president’s brother, Attorney General Robert Kennedy. During this first stage of the crisis, the accent was on secrecy, and the president maintained his schedule of campaign events to maintain an aura of normalcy. Meanwhile, the ExComm narrowed the options for the president to consider down to two. One option was a naval blockade of Cuba, popularly known as a “quarantine” to avoid hawkish overtones. A second option was far more aggressive, an air strike followed by an invasion of the island. The latter approach was viewed most favorably by the military as well as Republican critics who complained Kennedy was “soft on Cuba.” But the president opted for the milder quarantine option, which he felt gave both the Americans and the Soviets more time to reach a peaceful solution. The days that followed were full of tension as the world waited to see what would happen next. Back-channel communications between the White House and the Kremlin proceeded. But it was not until the following Sunday, October 28, that it became clear that the Soviets would not try to breach the American quarantine and would agree to remove its existing missiles from Cuba. In the court of American public opinion, Kennedy emerged a clear winner. His approval rating in the first Gallup Poll taken after the crisis was 74% – a jump of 13 percentage points from where it had stood previously. And his increased stature worked to the benefit of his fellow Democrats. The Republicans had their successes in November, particularly in the gubernatorial contests. They elected George Romney in Michigan, William Scranton in Pennsylvania, and reelected Nelson Rockefeller in New York. All three would run for the GOP presidential nomination in the course of the 1960s, although none of them would win it. But the Democrats arguably did even better in 1962. They elected a new cadre of liberal senators, including Birch Bayh of Indiana, George McGovern of South Dakota and Gaylord Nelson of Wisconsin, as well as the president’s younger brother, Edward Kennedy of Massachusetts, who had just turned 30 earlier that year. Some strong critics of the Kennedy administration were also defeated, including Sen. Homer Capehart of Indiana, Rep. Walter Judd of Minnesota (who was the keynote speaker at the 1960 Republican convention), plus the GOP’s presidential nominee that year, Richard Nixon, who lost a comeback bid for governor of California. And to Wicker and many of his colleagues, none of this had been foreseen a month earlier. More than two dozen midterm elections have been held over the last century. In only three has the president’s party gained House seats and in only three others have their House losses numbered eight or less. That includes President John F. Kennedy’s only midterm election, in 1962, which was colored by the Cuban missile crisis in late October. Source: Vital Statistics on Congress 2008 (Brookings Institution Press). Over the last half century, abrupt increases in a president’s approval rating have almost invariably been due to an event that creates a “rally round the flag” sentiment. Such events have included military threats to the country – including the Cuban missile crisis (1962) and the 9/11 terrorist attacks (2001) – the onset of the Iranian hostage crisis (1979), and the launching of military action overseas, as in the case of the two wars against Iraq (1991 and 2003). 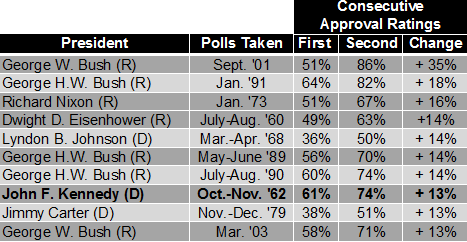 Following is a list of presidential approval rating increases of at least 13 percentage points in back-to-back Gallup polls since 1960.